Everyone knows that gluten is inherently evil. It’s just science. In recent years, a few valiant producers have taken a stand against this dietary monster, painstakingly crafting gluten-free versions of our favourite spirits for the world to enjoy. UPDATE: Some of you figured it out, but just so we're all clear: Happy April Fool's Day! 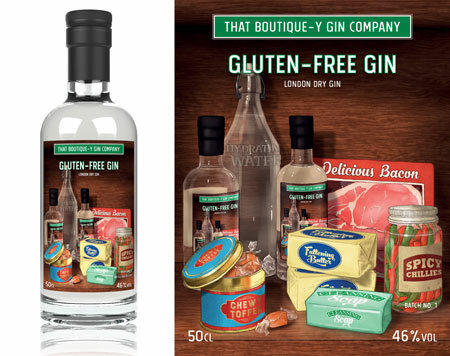 That Boutique-y Gin Company Gluten-Free Gin is not a thing (well, technically it is because all gin is gluten-free, but you know what we mean). 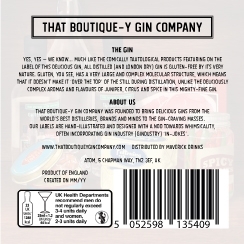 At That Boutique-y Gin Company, we’ve decided it’s time to join them in fighting the good fight and it’s with great pride that we present our newest product: Gluten-Free Gin. While the demand for gluten-free booze is indeed very real, the process of distilling gluten-free gin is no walk in the park, folks. Unfortunately it’s neither straightforward nor cheap to produce. In order to guarantee that not a single gluten protein makes it through distillation, That Boutique-y Gin Company Gluten-Free Gin is distilled entirely from farmers’ market-grade gluten free bread, which takes almost eight times longer to ferment than a more reasonable cereal. The botanical recipe includes gluten-free juniper, gluten-free orange peel, gluten-free grapefruit peel, gluten-free lemon peel, gluten-free angelica, gluten-free orris root, gluten-free cardamom, gluten-free coriander seed, and gluten-free almond, resulting in deliciously complex flavours of juniper, spice and citrus, with none of the gluten. To account for the extortionate cost involved in producing gluten-free gin, That Boutique-y Gin Company Gluten-Free Gin will carry an RRP of twice our standard range. The inflated price will be waived for customers who provide us with a doctor’s note confirming a proven intolerance to gluten. Spot our latest innovation, curiously depicted among a wealth of tautological items spanning chewy toffees, fattening butter, spicy chillies and more. This veritable collection is perched atop a rustic-looking oak shelf inside an old-fashioned shop. Just out of shot: nutty peanut butter, wobbly jelly, and crumby bread. Nose: Soft and fresh, with lively orange and grapefruit. Palate: Thick, itchy and mouth-coating. Warming, earthy spices follow, underscored with classic London Dry notes of coriander, cardamom and angelica. Finish: Long and lingering, with a pinch of juniper and a slight nuttiness. Pour all ingredients into a cocktail shaker filled with ice. Shake vigorously. Strain into a chilled highball glass with ice cubes, top with soda water and garnish. Delicious and completely free from nasties. The tartness of the lime cuts through the Himalayan sugar to temper the sweetness. The perfect accompaniment to a summer’s evening. Fill mixing glass with ice cubes, combine gin and vermouth, and stir for 30 seconds. Strain into chilled cocktail glass. Arrange olives on gluten-free toothpick and serve. The earthy, nutty notes of the gin shine through in this Grain Free Martini, balanced with refreshing leafy notes and a touch of citrus. Delightful paired with lactose free cheese and rice crackers.